My first-frost date in this part of Zone 6 is October 15th. 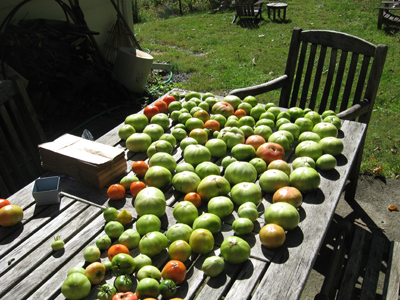 That’s tomorrow, and I knew last weekend that I would not be home early enough, or able to go into the office late enough, to harvest my green tomatoes if frost threatened during the week. 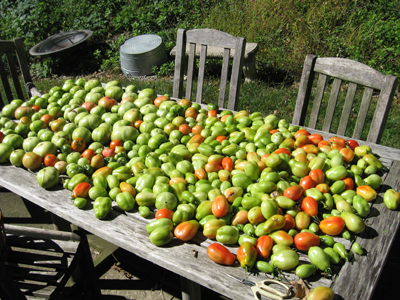 So I was proactive instead of reactive, and I harvested my blushing, and full-on-green tomatoes. It took me all day and I loved every minute. 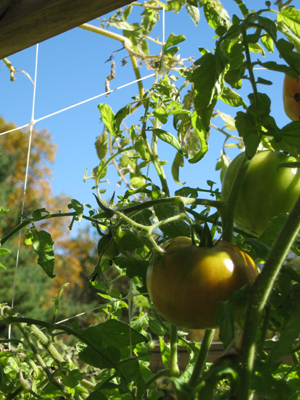 Most of the tomatoes were still green, but a few showed a promising blush. 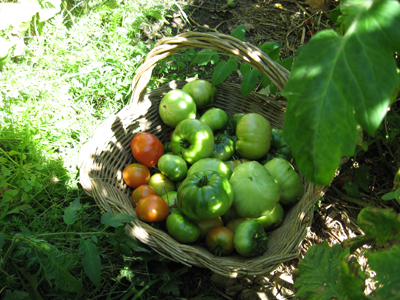 I brought my basket into the garden with me, and filled it over and over again with potential. I look at the green and see red. Salsa, spaghetti sauce, canned tomatoes. First to arrive: the slicing tomatoes. The heirloom Moskvich and Brandywines. The table was soon amply laid. My version of the colors of autumn! 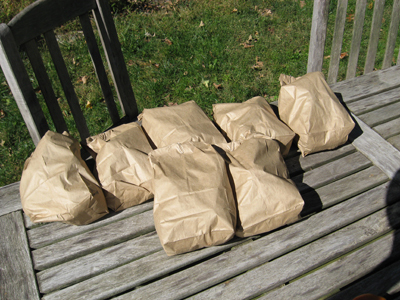 After reading all of the suggestions I mentioned in an earlier post about how to ripen green tomatoes, I chose the brown paper bag route. I gathered my supplies, lunch bags, paper clips, and trust (in the method). A brand-new package of lunch bags made me feel like it was the first day of school. It was certainly the first day of a whole new project for me, this alchemy of turning green to red. 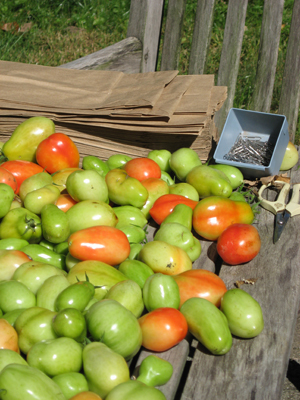 I put about 5 or 6 tomatoes into each bag — enough to encourage them to ripen (do tomatoes respond to peer pressure? ), but not enough to risk crushing the ones on the bottom. And sadly, the energetic greens and soft reds disappeared into the patient brown of the Great Wait. 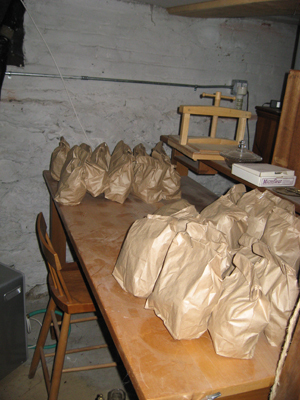 And into the basement go the bags! To a spot that is cool and dry. And, as Peter Pan would say, “Oh, the cleverness of me!” We’re having a torrential Nor’easter tonight and I bet I would have lost many of the fruits left on the vine. I got them, and just in time.